By the mid-1960s, Jean-Luc Godard was at a crossroads. In a mere five years he had made nine feature films, which, through their audacious brilliance, had made him the most talked about director in the world. By and large, these earlier films had relied on pre-existing frameworks or genres as a basis out of which their creator’s extraordinary knack for spontaneous invention could flourish. But by the time he started shooting Pierrot le fou, the film noir conventions underlying its source novel, Lionel White’s Obsession, on longer interested him. Instead, the rapidly escalating war in Vietnam, the break up of his marriage to Anna Karina, and his own self-doubt concerning the value of what he had achieved, spurred Godard on to new heights of creative originality. He said that, in making Pierrot le fou, he felt as if he were making his ‘first film’; tearing up the old road map and setting out for unknown territory. Despite this declaration of a new beginning, however, Pierrot is, in many ways, a culmination of everything that had gone before. Indeed the publicity campaign advertised the film as: ‘A little soldier who discovers with contempt that one must live one’s life, that a woman is a woman and that in a new world one must live as an outsider in order to find oneself breathless.’ Once again there is a love affair that leads to disillusionment and death, quotations from literature and other movies, musical interludes, self-referential jokiness, coloured filters and car crashes. Characteristically Godard filmed the genre elements of the story with a conspicuous lack of interest, focusing instead on the creation of unforgettable images and arresting sequences. He described the creation of the film as ‘completely unconscious’ and the shoot as ‘a kind of happening, but one that was controlled and dominated.’ The freedom of this approach allowed Godard to turn a standard pulp thriller into a deeply personal and emotionally raw statement about the state of the world, the nature of art, and most importantly, the breakdown of his marriage. The film packs an accusatory punch and the target of the accusation is, incredibly, the star of the film. Godard had married Anna Karina in 1961. Theirs had been a passionate but fraught relationship. In between the highs of their cinematic collaborations, there had been frequent arguments, bitterness, recrimination, the loss of a child, and suicide attempts. By the time they came to work together on the set of Pierrot le fou, they had already separated following Karina’s affair with Maurice Ronet on the set of Le Voleur de Tibidado. In the core sequence of the film, set in the natural splendour of their south of France refuge, the contradictions in their relationship are played out. While Ferdinand is happy to remain there in isolation like Robinson Crusoe, writing in his journal and contemplating the universe, Marianne soon becomes restless. In a famous scene, she wanders past him, complaining over and over again, ‘What can I do? I don’t know what to do’ – Ferdinand’s idyllic dream is thus destroyed by Marianne’s demands, and, as it later turns out, her betrayal. Nevertheless, the argument isn’t all one-sided. Our sympathies are often with Marianne, whose frustration, when confronted with Ferdinand’s self-absorbtion, is all too understandable. The man is a walking library; he appears unable to do anything without seeing it in terms of a canon of illustrious predecessors. Indeed the film, like a poem by TS Eliot, is full of references to art, poetry, film and philosophy. Artists and writers referenced include Velazques, Picasso, Chagall and Liechenstein, Balzac, Browning, Conrad, Stevenson and Chandler. Even the names of the characters – Marianne Renoir (from Auguste and Jean) and Ferdinand (from Louis-Ferdinand Celine) are signposts. Like Eliot, Godard is acknowledging his work as belonging to an important artistic tradition, a tradition that stretches much further back than the still immature medium of cinema. But cinema too is celebrated in the guise of American movie legend Samuel Fuller, who offers his definition of the artform: ‘A film is like a battleground. It’s love, hate, action, violence, and death. In one word: emotions.’ Godard thereby acknowledges the work of a hero but his approach is different – more that of an essayist than a storyteller. He composes in depth, rejecting naturalistic drama in favour of disconnected imagery, voice-over recitation, direct to camera speeches and set-piece interludes. It is as if he is trying to break out of the constraints of cinema, with all its familiar genres, conventions and forms, and take it to another level. Incredibly, in this endeavour, he is largely successful – the film is a milestone in the history of cinema whose influence has been immeasurable. 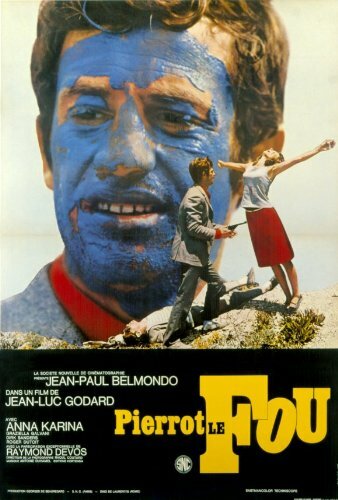 Pierrot le fou was booed when it premiered at the Venice Film Festival and unsuccessful at the box office when released in Paris in 1966, though it was not without its supporters. Michel Cournot described it as ‘the most beautiful film I’ve seen in my life’ and Andrew Sarris, writing in 1969, called it ‘the kind of last film a director can make only once in his career.’ With the benefit of hindsight, the film now looks like Godard’s fond farewell to the first part of his career, a last madcap romantic escapade before engaging with more serious concerns. It is also a farewell to Karina, and in a way a resigned acknowledgement that they were never meant to be together. Although Marianne betrays Ferdinand there is no malice in her portrayal, and in the final voice-over the suggestion that perhaps they are together in eternity.